The story I’m about to tell is confusing. It’s about people you’ve never heard of, some of whom make bad decisions. In the end, people die and nothing much changes. In short, it’s a story about the West and Afghanistan. In 1838, Dost Muhammad Khan was the Amir of Afghanistan. He had seized the throne in 1824 from Shah Mahmud, who had previously deposed his own brother, Shah Shuja. (Don’t feel sorry for Shah Shuja. He gained the throne in 1803 through a series of conspiracies that dethroned two of his brothers.) Despite the fact that he seized a throne that wasn’t his, Dost Muhammad was a popular and capable ruler who restored peace and prosperity. In 1837, a Persian army laid siege to the Afghani city of Herat. Unable to come to terms with the British for military aid, Dost Muhammad turned to the Russians for support. The governor-general of British India, Lord Auckland, assumed that Afghan friendship with Russia meant Afghan hostility to British India. He decided the only way to save Afghanistan from Persian and Russian aggression was to restore the elderly Shah Shuja to the throne he had lost thirty years before. The Army of the Indus set out in December, 1838, The plan was that Shah Shuja would enter Afghanistan at the head of his own troops, with a little support from the British army. Once he was securely in power, the British army would withdraw. Auckland believed that the threat of British bayonets would be all it took for Shah Shuja to be welcomed back on the throne. Instead the Army of the Indus had to fight its way to Kabul through country that its commander, General John Keane, described as “full of robbers, plunderers and murders, brought up to it from their youth.” It took them eight months to reach Kabul and install Shah Shuja on the throne. It quickly became clear that the only way the new Amir would stay on the throne was if the British army kept him there. The Army of the Indus became an inadequate and unwelcome army of occupation. Afghanistan was in a permanent state of unrest, with random acts of hostility and violence directed against its British occupiers. The British leadership of the expedition was ineffectual. General Elphinstone, the commander in chief, was an elderly invalid who was no longer able to direct an army in the field and unwilling to delegate authority to his deputy. The real authority over the expedition lay with the viceroy’s envoy, Sir William Macnaghten. 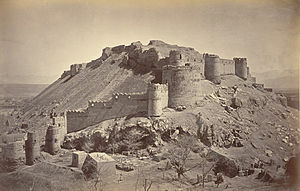 Under the direction of Macnaghten and Elphinstone, the British moved out of the Bala Hissar, a fortified palace outside of Kabul, and built a conventional cantonment, including a racecourse. They settled into garrison life as if they were safely in India. Some even called for their families to join them. Despite unmistakable signs of trouble, the British were completely unprepared when revolt broke out in 1841. On November 2, an Afghan mob stormed the house of a senior British political officer who was said to have trifled with local women and murdered him and his staff. The British soon found themselves besieged in their indefensible cantonments. Efforts to clear the high ground that dominated the cantonments failed. An attempt at parley resulted in the murder of Macnaghten. The British made the reluctant decision to retreat to India. They made a treaty with the Afghans, who guaranteed their safe conduct to India in exchange for British withdrawal from Kandahar and Jalalabad. A number of British officers and their families were held as hostages, a demand that ultimately saved their lives. On January 6, 1842, 4500 British and Indian soldiers and 12,000 wives, children and servants marched out of Kabul. On January 13, a single survivor, Doctor William Brydon, reached the British garrison at Jalalabad, sixty miles to the east. The rest were slaughtered by the Ghilzai tribesmen who controlled the mountain passes. Shah Shuja was assassinated four months later. Dost Muhammad returned to Afghanistan the following year and ruled until his death in 1863. **Just for the record, you can blame Kipling for setting me on the path that led to History in the Margins. I read Kim when I was eight and never recovered. I knew that Afghanistan had complicated relationships with both Russia and Britain during the colonial era, but I’ve never even heard of the 1842 massacre! Wow! Complicated doesn’t begin to describe it.